Al-Qaeda in the Islamic Maghreb (AQIM) claimed responsibility for Sunday's attack, saying it was "in reaction" to the visit to Chad by Israeli Prime Minister Benjamin Netanyahu, according to the Mauritanian Al-Akhbar news agency, which regularly receives statements from this armed group. UN Secretary-General Antonio Guterres condemned what he described as a "complex attack" on the UN camp in Aguelhoc, some 200km north of Mali's Kidal region towards the border with Algeria, and called for the perpetrators to be brought to justice. 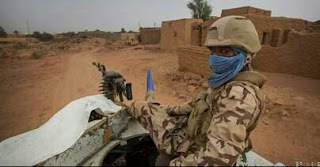 More so, at least 10 peacekeepers from Chad have been killed and 25 others wounded in an attack on a United Nations camp in northern Mali, according to the world body.